Delivering content in multiple languages provides learners with an improved experience that better meets their needs. But, content is always changing; you’ll need to keep it updated regularly. This can be a big pain if you have multiple versions of content for different languages. Elucidat’s eLearning translation feature helps to resolve this issue and circumvents the nightmare of multi-version updating. 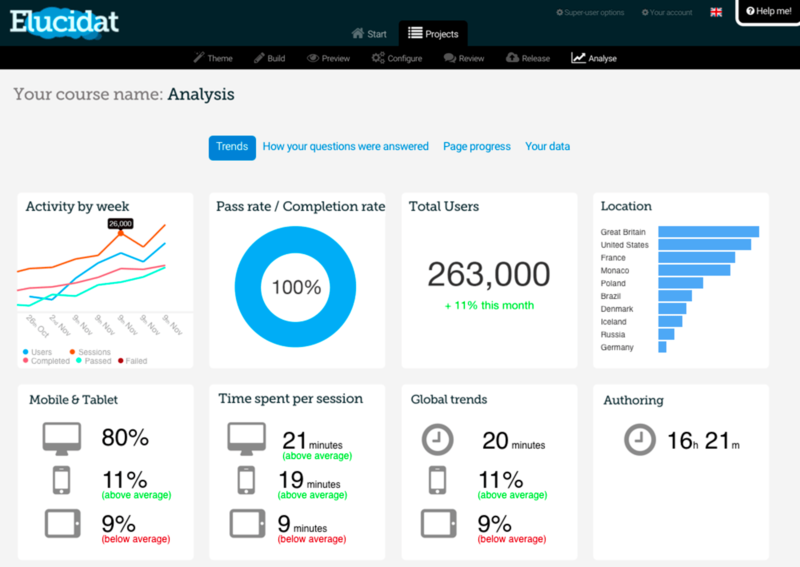 Elucidat's Analytics feature offers data-led information that you can easily access via your dashboards and use effectively for your projects. You can gain valuable insight on your users, including the time they spend viewing your learning content, the devices they use to access it, how they answer each question, their locations, and the points at which they leave your content. When combined with the translation feature, you can view track content on a global level. Instead of tracking different language versions of content across multiple courses and Learning Management Systems, Elucidat let you track all translated content and courses together from one central location. Since change is a constant, it’s vital to be always ready to respond to it. 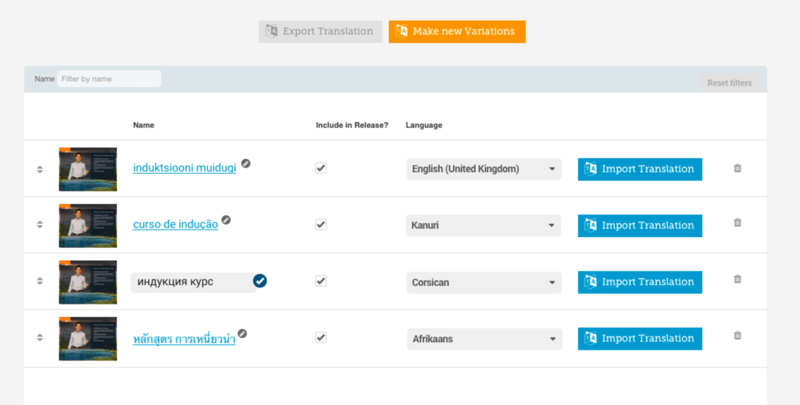 Elucidat’s translation features let you quickly update multiple versions of content instantly. For instance, if you notice that learners are having a difficult time understanding the answer to a particular question, you can improve the content by adding a process image to act as a visual aid. This change is then instantly updated to all versions of your content, using Elucidat Rapid Release technology. Let’s look at another example. Imagine your learners share that they want to be able to get to case studies from your learning content’s menu. 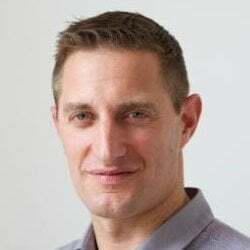 You can add that to your content and use the Rapid Release system to make the changes instantly to all multilingual versions in about a minute. Creating local content via Elucidat’s Styles feature allows you to deliver a consistent brand while easily modifying specific language versions without affecting the other language versions of the Master course. For example, imagine you need to update the first page’s logo and colors for 3 different language versions. 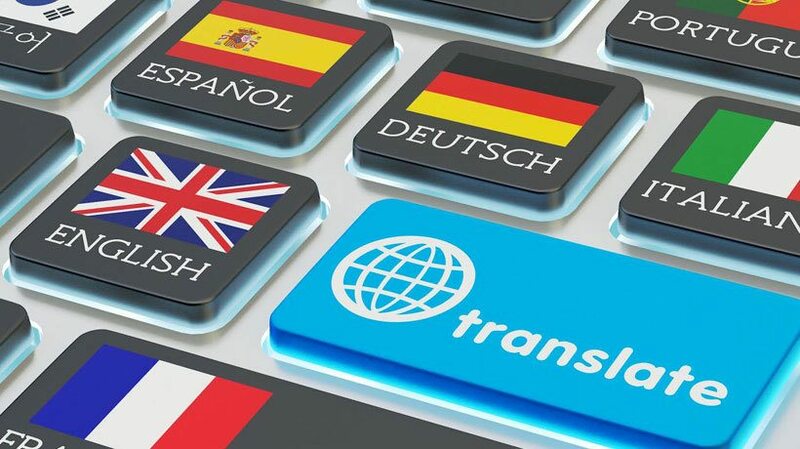 Elucidat’s translation feature lets you add in these different elements quickly without needing to re-create and update the three entirely different courses. Elucidat’s eLearning translation feature enables learning teams to track analytics on a global level and quickly make changes to different versions from a central location or “Master course”. Discover more about how Elucidat’s eLearning translation feature can help your learning team create better-quality learning content faster by watching this demo video.